Our class this year has 20 children in it. There are 7 pupils in P5 (3 girls/4 boys), 5 pupils in P6 (4 girls/1boy) and 8 pupils in P7 (6 girls/2boys). Our class teacher is called Miss Reid and she has taught at Gelston for over 10 years now. Mrs Maxwell also teaches us on a regular basis, she is our school support teacher. 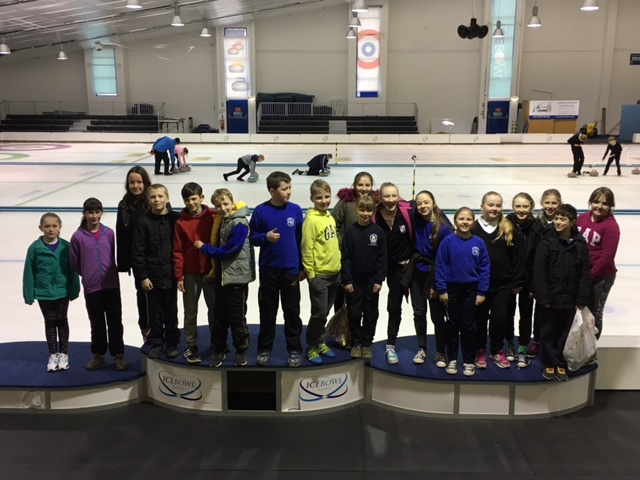 The pupils in P7 recently attended a coaching session at Dumfries Ice Bowl with the P7s from our partnership school of Crossmichael. Erin said, "I was more confident on the ice this year. I felt that my balance was a lot better. It was a very exciting experience." Our IDL or topic this term has been China. Mrs Marscheider joined us at the end of February for 5 weeks, she is training to be a primary school teacher. We learned lots about Chinese food and as part of our food technology learning outcomes, we got to cook a Chinese dish from a recipe we created. Fraser said, "I thought it was really, really good. I made a vegetable rice with honey, it tasted brilliant! When I took it home, my little brother tried it too and he said it was brilliant as well." Lucas recently shared with us at "Achievement Assembly" that he can now stop and turn at ice skating. Lucas said, "At the beginning I always felt like I was going to fall over and land on my bottom but now I am getting more confident and I don't fall over as much."